Ireland is a country of romance and mist fueled by fantasy, ancient castles, Guinness, music, pony treks and a warm cuddle by the fire. Being Irish ourselves, we at Authentic Ireland are hopeless romantics. Choose one of our Ireland honeymoon packages or romantic getaways that you’ll remember for the rest of your lives. All our romance and honeymoon vacations include accommodation, transportation of your choice, and a selection of unique Irish experiences and meals. A kiss in Ireland is like no other. Believe it! What Better Place is there to celebrate your Romance than in Ireland? Imagine the welcoming fire of a 17th century Manor House in Ireland inviting you into your suite. It’s the perfect atmosphere to reconnect, to unwind, and to enjoy each other. If you can motivate yourselves to be around other people, take a side trip to the awesome Cliffs of Moher. For your next stop we’d suggest an elegant castle built in 1590. Just closeby, it’s the perfect retreat. Cuddle up and explore the gardens, or amble over to legendary Killarney. Wrap up your magnificent castle lodging at the library bar. It is the ultimate kiss. Dingle is one of Ireland’s best-loved towns, and we’re particularly fond of the Presidential Suite, one of the finest lodgings in Kerry. Dingle’s glorious bay, lovely shops and a world of music… Dingle’s hotel spa and gourmet restaurant are yours for the asking. Finally, we’d suggest you indulge in each other’s company in charming Adare, and why not make it a Conde Nast Choice Manor House? 840 acres of rolling parkland and gardens will surround you with peace and beauty. Sometimes the world spins so quickly, and we lose each other. Our cure? Surrender, and let Ireland stoke the flames. featured writers, Meredith and Win Blevins. 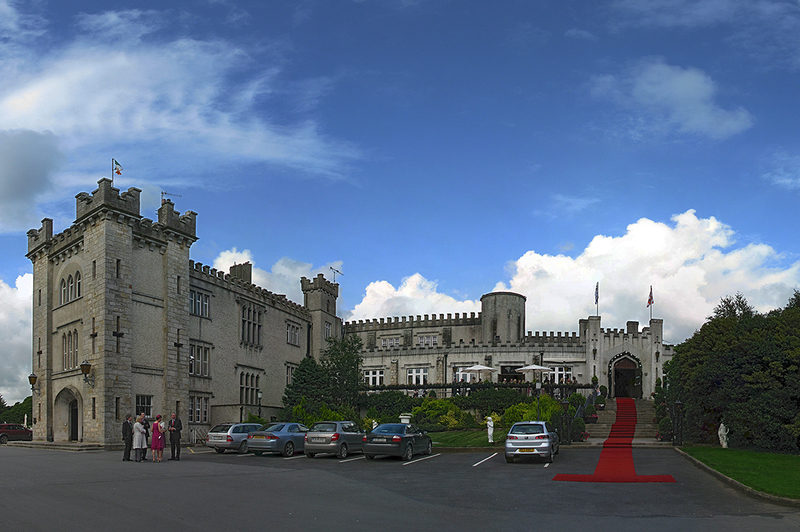 Stay in an Irish Castle!! Discover the Heart of Irelandfor 50% off, while the packages lastThere are few spots where you can travel in Europe that are as timeless as Ireland’s wild countryside. Craggy coastlines and rolling meadows, dotted with sheep and an occasional crumbling castle, belong to the misty past. They shoot us back in time and we are there. Dublin, Ireland’s capital, is an electrifying combination of history and a cutting edge art and music scene. Sample fine food, wine, beer, traditional music. Step 1500 years into the past and discover the Book of Kells. Authentic Ireland Travel’s seven-day, six-night Dublin and Castles of Ireland custom tour provides a taste of all that Ireland has to offer. You’ll follow a flexible itinerary that includes transportation. lodging, a rental car, unique guided walking tours, and some incredible meals. Below is the itinerary. Let your imagination take you for a ride! Days 1–3: You’ll arrive at Dublin Airport and hail a cab to Pembroke Townhouse. This is an 18th-century Georgian Manor House. Luxurious and cozy, it’s your perfect Dublin base for three days. Dublin is a walking city. Get out and explore! You’ll arrive with a three-day pass for a hop-on, hop-off bus which goes by the city’s landmarks. One day in Dublin, you’ll take a guided walking tour that meanders through some of the overlooked pockets of this vibrant city. In the evening, enjoy music and brew in a legendary pub or kick back in front of the Pembroke’s fireplace with a drink and a book. Days 4–5: On the 4th day, your rental car is waiting. Now, journey into Connemara. The heritage home of many Americans, this is a wild country, and beautiful, on Ireland’s western coast. You’ll stay two nights in Abbeyglen Castle, a sprawling stone fortress with ivy wandering up the towers. This storybook lodging features sumptuous guest rooms and amazing views of mountains, seas, and the dreams of queens and kings. Connemara National Park, a wild protected area, offers a wonderland of lakes and glens to explore. While staying here, you’ll enjoy a luxury catamaran tour on Ireland’s only fjord. Dine in peace aboard ship and savor your three-course lunch. Days 6–7: A four-hour drive through Ireland’s rolling countryside takes you to Bellinter House, a country manor built in 1750 for a wealthy landowner. Enjoy the gorgeous grounds, play billiards, take advantage of the natural spa treatments. You can use this as a base to explore Newgrange. Newgrange, older than the pyramids, is an ancient site built into a large mound. The structure was used to calculate the movement of the heavens and it measures the winter and summer solstice. Authentic Ireland has a Groupon special that we’d like to share with you. It’s about romance, staying in castles, and one week in Ireland. All for 50% off. Ireland is the soul of romance fueled by fantasy, ancient castles, heroic myths, magical forests, Guinness, pulsing music, and warm cuddles by the fire. You’ll enjoy exquisite Manor Houses and Intimate Castle Lodgings. In Killarney, there is a banquet of activities nearby, yet your hotel is filled with the texture of peace, easing you into a gentler era. Is a castle stay on your itinerary? Absolutely. As their special guest, you’ll have everything you need to treasure your romance as if it were an elegant dream. Finally, we top off your experience in a Manor House Hotel tucked in the heart of a historic village. It is the best of old world elegance and charm, fused with modern amenities. Each destination is unique, and all invite you to unwind and enjoy each other. We have arranged a horse and carriage ride through legendary Killarney Forest and its magical ring. On another afternoon, hold hands as you wind through the ancient paths of an Ireland Walking tour. 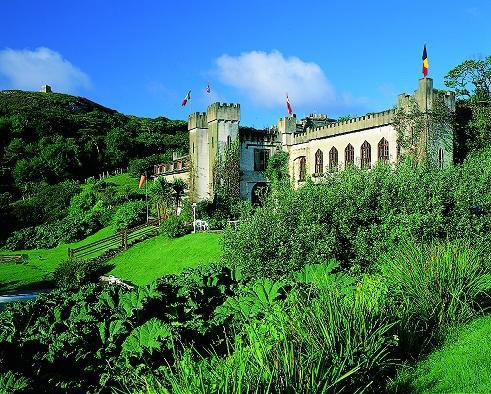 Your last evening will find you reveling in a 16th century castle, enjoying a medieval banquet. Wander cobbled streets, duck inside a pub and warm yourselves by the fire. What good fortune—fine food, drink, and your sweetheart by your side. There is no better place to celebrate your romance than Ireland. Come to Ireland, and fall in love all over again. At 50% off, you can make your romantic dream a reality.